Exploring the diverse factors that persuaded Christopher Columbus that he could reach the fabled "East" by sailing west, Dante, Columbus and the Prophetic Tradition considers, first, the impact of Dante’s Divine Comedy and the apocalyptic prophetic tradition that it reflects, on Columbus’s perception both of the cosmos and the eschatological meaning of his journey to what he called an ‘other world.’ In so doing, the book considers how affinities between himself and the exiled poet might have led Columbus to see himself as a divinely appointed agent of the apocalypse and his enterprise as the realization of the spiritual journey chronicled in the Comedy. 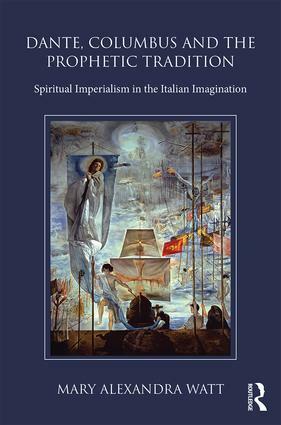 As part of this study, the book necessarily examines the cultural space that Dante’s poem, its geography, cosmography and eschatology, enjoyed in late fifteenth century Spain as well as Columbus’s own exposure to it. As it considers how Italian writers and artists of the late Renaissance and Counter Reformation received the news of Columbus’ ‘discovery’ and appropriated the figure of Dante and the pseudo-prophecy of the Comedy to interpret its significance, the book examines how Tasso, Ariosto, Stradano and Stigliani, in particular, forge a link between Dante and Columbus to present the latter as an inheritor of an apostolic tradition that traces back to the Aeneid. It further highlights the extent to which Italian writers working in the context of the Counter Reformation, use a Dantean filter to propagate the notion of Columbus as a new Paul, that is, a divinely appointed apostle to the New World, and the Roman Church as the rightful emperor of the souls encountered there. Mary Alexandra Watt is an Associate Professor of Italian Studies and Associate Dean in the College of Liberal Arts and Sciences at the University of Florida, USA.